For those that want an explanation of some terms. These are what is SUPPOSED to be the grade chart. Plus some other definitions of specific rundowns (procedures) that might be given. I should be adding more later. Scientology Drug Rundown (Scn DRD): To handle the spiritual/mental aspects of drugs. This is done after the purification RD. False Purpose Rundown (FPRD): Auditing/confessionals done to 1) remove the charge associated with overts and withholds (basically sec checking/confessionals) and 2) get rid of the underlying false or evil intentions causing a person to actually commit those overts/withholds. Supposed to give one resurgence of purpose and confidence in the ability to reach out. ARC Straightwire - Auditing done to improve a person's ability to recall. Expected End Result: Knows he or she will not get any worse. Expanded Dianetics - designed to bring freedom from cruel impulses and chronic unwanted conditions. Clear Certainty Rundown (CCRD) - to verify and acknowledge the State of Clear if achieved through NED or past life, etc. Grade 5 - Power Processing - Ability to handle power - only given to preclears that didn't go clear on NED. Grade 5A - Power Plus Processing - Stabalizes Power - only give to preclears that didn't go clear on NED. Sunshine Rundown (SRD) - Designed to put a polish on the state of clear, bringing a person to a point where he appreciates the new state he has achieved. Good post, Grundy! I've been blabbering on to my friends that we needed something like this while lazily not doing it myself. Ill do more later on tonight. I find when I start explaining, I take hours and hours to do so. These are levels above "Clear" which are still dealing with handling "bank" or "aberratons" but instead of the first dynamic, it is on the other dynamics. "Original OT I-VII" were processes which were supposed to increase OT ability or handle the things that were supposed to be handled on OT levels. However, the OT levels were changed at some point to what they are now. New OT I - Expected End Result (End Phenomenon) (EP) A fresh causitive OT Viewpoint on the MEST universe and other beings. OT II - Expected EP - ability to confront the whole track. New OT IV - OT Drug Rundown - given to eradicate the last bit of effect of drugs on the being (thetan). New OT VI - Solo New Era Dianetics Auditor Course - this trains you to run Solo NOTs on yourself out in the field. These are levels that are actually designed to increase OT abilities. You are no longer auditing out abberations but actually increasing spiritual ability. STCC (Success Through Communication) Course - to give a person basic drills teaching him how to handle communication in social and business environments. Life Imrovement courses - Course which are delivered to give a person information on using Scientology for certain areas of their life. Marraige, Ups and Downs of Life, etc. PE (Personal Efficiency) Course - Addresses specific problems in life and teaches people to use Scientology for many basic areas in life. M1 (Method One) co-audit - A procedure to clear up misunderstood words that a person has encountered throughout their life that they might have negative spiritual energy (charge) attached to. The below must be done at actual churches of scn. PRO TRs (Hubbard Professional Training Regimens) Course - Teached people the communication drills necessary to deliver auditing. Expected to make a person that can handle life's situations with communication alone. Hubbard Pro Metering Course - teaches people to handle an emeter properly. Last edited by Grundy on Wed Mar 12, 2008 5:49 am, edited 1 time in total. HSS (Hubbard Senior Scientologist) - Class VI - Saint Hill Special Breifing Course (SHSBC) - A training program to teach A) all of Dianetics and Scientology non-advanced level technology, in order of development and B) To train an auditor to deliver all procedures and rundowns below Grade V (including NED). This is the big mamma jamma of all courses. All books. All tapes. All procedures. To take this you must have completed either A) all training through Class V or B) Be a clear or OT who has taken all trianing below Class 0. HSST (Hubbard Specialist of Standard Tech) Class VIII - Ability to handle all cases to 100 percent Standard results, deliver advanced procedures and corretive actions. (I believe this is where you learn to deliver OT IV). HAC Specialist (Hubbard Advanced Course Specialist) - Class IX - Ability to deliver OT V (NOTs - Second Wall of Fire) and all review actions through OT VII. OEC - Organization Executive Course - Training on all policies for all areas of an organization. This can be completed (theoretically) by doing all OEC courses for each volume which applies to the various departments of an organization. This course trains people to manage organizations. These train a person to direct other auditors to standardly deliver procedures for each level. You must be a certified auditor for the level before doing the C/S course and internship. HPCSC - Hubbard Professional Course Supervisor Course and Internship - trains a person to standardly train others. It should be noted that a Course Supervisor does NOT have to have done the courses he is supervising. He is supposed to ensure that the student does all requirements according to a checksheet of items. HMCSC - Hubbard Mini Course Supervisor Course - a course to train people quickly to run a course room. This is the minimum required to run ANY courseroom. KTL - Key to Life - Training and Auditing procedures to get a person able to communicate fully and clearly and to be able to undertstand the communications of others. LOC - Life Orientation Course - Training and Auditing Procedures to get a person competent in the Physical Universe. PRD - Primary Rundown - A course to make a superliterate, a person that can read an immediately apply anything. This consists (or used to consist) of doing the Student Hat and all materials of the student hat using method 8 word clearing (clearing in a dictionary every definition of every word contained within the student hat course) before studying the material. Do you want me to finish up with things like the PTS/SP course, Ethics Specialist etc? Or is this enough/too much already? "Definitions and Explanations for Most Scientology Services"
Holy shitsticks, Grundy, keep it coming. Lemme know when you're done, and I'll put it on the "Training and Auditing" page. This is content gold. PTS/SP (Potential Trouble Source/Suppressive Persons) Course - Teaches people about Suppressive Persons - people that suppress or put down one (in practice it's those that suppress the church) - and Potential Trouble Sources (People who are connected to SPs) - and how do deal with PTS Situations. Therapuetic TRs Course - Teaches a basic level of TRs to PCs who have gotten auditing but have never done TRs. Basically to inculcate them with what happens in auditing. This course is almost never done because PCs are usually sold either HQS or Pro TRs courses. Scientology DRD (Drug Rundown) also has a co-audit course available. I've only seen this done rarely. Usually PCs are sold intensives for DRDs. Scientology Minister Course - A minister trained in the fundamental beliefs of the great world religions, the religious nature of Scientology and the duties and ceremonies of a Scientology minister. I actually think that this course has great value. Because it does force scientologists to at least have a basic understanding of other religions. PTS/SP Rundown - an audited procedure to release charge from past PTS situations thereby putting a person more at cause in his life. BSM (Basic Study Manual) - a more basic course than the student hat to teach the basics of study technology. Special Rundowns Courses - Many of the special rundowns have courses which teach class IV or class V auditors to deliever specific rundowns. This is often done in smaller organizations that can't afford to wait to train their staff auditors on the complete Class V Graduate course. Hubbard Assist Processing Course - teaches an auditor to standardly deliver scientology "assists" - procedures used to help alleviate current physical or emotional conditions which would prevent them from being audited on grade chart actions. Hubbard Introduction and Demonstration Auditor Course - teaches people to audit demonstration procedures that introduce scientology to people and demonstrate how auditing works. It's funny, but these procedures probably are the most valuable thing in Scientology. Because each procedure actually deals with specific things and helps to release them. This is what a lof of people outside of the official church feel that Scientology should do. Okay - NOW .. if you have specific questions on specific courses or auditing or feel I have misrepresented anything, feel free to post and comment, and I will revisit my thread(s) on occasion to add or clarify. Scales are a very important part of Scientology. Pretty much everything is arranged in some sort of scale or heirarchy. Human emotion, human conditions, processing (auditing), training, organizational structure ... everything. Probably the most important in Scientology is the Scale of Awareness. Pretty much everything is put somewhere on this. Tone (emotional level), organizational structure (different departments are supposed to reflect different awareness characteristics), the training and auditing bridge. This is the chart which ties it all together. There is a post somewhere on ESMB which lists them and I can find it right now. Can someone post a link to the list on ESMB? So, everything in Scientology can (theoretically) be understood better if one understands what scientology means by these different levels. Some are self explanatory. Many could use definition as to what scn defines them as. I will, to round out this thread (and it won't be for a few days maybe) get this list and define what I feel needs defining, or post a link to how someone defines these. The chart of awareness as applies to the organizational structure of Scientology I have put under the Staff/Sea Org Thread. I will be doing the bridges use later. To heck with it lol. Trying to make the bridge make sense according to the awareness scale requires a litte too much pushing what they teach you and I am not trying to promote the church as it is. So if someone really wants me to do it, I will. But unless specifically asked for, I'll just leave it alone. Is there not a sane person asking the obvious question? How is it that this ridiculously complicated mechanism for "redemption" is believed to be "the Way?" Could it not be compared to a lifelong course in computer programming, only to find out near the "end" that all you can do is some simple coding in "Basic" (but you're convinced that you've reached the zenith of computer languages). What happens to your logic, judgment and reasoning ability? Is everyone kept in such a tight little cocoon that they cannot see "the forest for the trees?" There are people that do and have found value to it. In any system of belief the the true beleivers never question the accuracy of what they are told. Ever try to argue the historical vs mythological aspects of the story of Jesus with a christian evangelical? The more I find out, the curiouser I become! I agree with the proposition that "it works and has value." But the degree to which there is any significant human achievement is beyond questionable and the VALUE aspect is ludicrous in the extreme (IMHO). I still say AMWAY would be the better alternative! And "Yes," I've had that axiomatic discussion with MYSELF as a Christian -- it's a therapeudic method of dealing with my closet schizophrenia. Over my 50 years of personal study of Christian history & faith (including college training), I have never had a problem with the historical evidences of Jesus nor of the New Testament narratives of His existence (I've not had a lot of time for the diversity of creative myths that have circulated about Him, though). 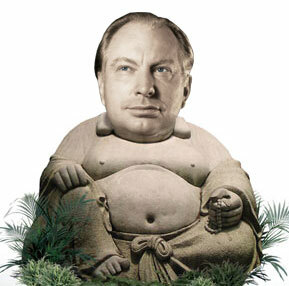 I consider the discussion of Scientology as legitimate religion on a level beneath that of my own Christian experience. For me, the tenants of the CoS only resonate when I think of them in the context of mental deception. Admittedly, this is only based on a "crash course" of research over the past couple of months, but it seems to be corroborated by many whose stories are told here and elsewhere. I've heard David Miscavige speak in terms so thick with Bizarro-code it makes my head spin. I've also read the wrenching stories of individuals whose young lives have literally been stolen from them. I'm only supposing that they would not characterize Scientology as having "worked" for them. For me, L. Ron's "doctrine" was purely a concoction of mental aberrance and his own powerful imagination. It repeatedly has defied any scientific demonstration, it flies in the face of logic, it creates its own convenient enemies to rally the faithful, it prostitutes the natural tendencies of many who actually want to do some "good" in this world, and has created little or nothing of societal change in its 50 year history (unless you want to count empty wallets versus current real estate holdings), and it reacts with a corporate paranoia unmatched in polite society to any perceived threat or challenge. I suppose Mormonism has run a close second place, but at least they have some REALLY cool stuff like SPECIAL UNDERWEAR and the multiple wives thingy going for them. I'm not sure that my view from the "Outside" contributes much to the discussion but hopefully it can be judged on the basis of my relatively long tenure on the planet. Live long and prosper my friends. My personal best to each of you. Well, I got what you are saying. I disagree with you though. I don't know if it should be called a religion. But I have experienced things spiritually in it. If you read my posts on ESMB, you will see that I do have issues with the organization. And I recognize that there are problems with the "theology" if you will. But I don't agree that it's a total mindf*$k. Grundy wrote: But I don't agree that it's a total mindf*$k. I obviously don't know a LOT about Scientology's "deeper" precepts. But I'm workin on it. You're right ... there are probably many principles that work, simply because they're inherent to the human condition. I just don't believe they are original with Hubbard. Many of the same helpful behavioral concepts can be found in everything from the Boy Scouts to Tony Robbins, who says on his web site that he ... "has uncovered and refined a unique system for anyone who wants to take their life to the next level." I guess my thought about Hubbard's CoS can be reduced to a saying my In-laws in Tennessee have ... "Even a blind hog will root up an acorn once in a while."